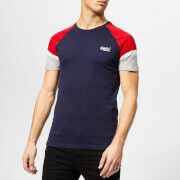 Men's crew neck T-shirt from Swedish brand, Peak Performance. Cut from a soft cotton blend with comfortable stretch, the 'Track' tee features a ribbed crew neck, short sleeves and contrast 'P' logo to the chest. Quick-drying, the top will help to keep you cool and comfortable during activities. Finished with 'Peak Performance' print down the centre back. Relaxed fit.